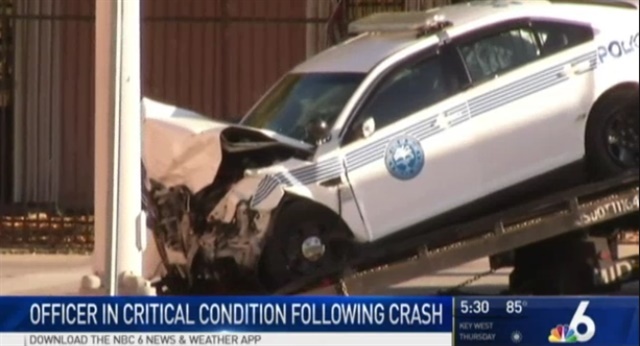 A Miami Police Department officer was rushed to the hospital after a crash in Wynwood, FL, early Monday morning, and is in critical condition, reports NBC Miami. Officials say the vehicle driven by Officer Carlos Gomez crashed with another car near Northwest 29th Street and 2nd Avenue around 4:30 a.m. Police confirmed the officer was not involved in a chase at the time. Police spokeswoman Kenia Fallat told reporters at the accident scene that Gomez was "responding in emergency mode to a priority call'' when the crash occurred. Fallat says Gomez's cruiser was then pushed into a building near the intersection. The officer was unconscious and trapped inside the vehicle when help arrived. Gomez, 26, was rushed to Jackson Memorial Hospital, where he was in critical condition. Fallat said he had head, leg, and internal injuries. Blood mobiles have been set up to accept donations for the officer. The driver of the other vehicle, 47-year-old Julio Jimenez, was also taken to the hospital in stable condition.